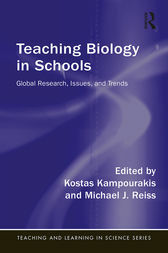 An indispensable tool for biology teacher educators, researchers, graduate students, and practising teachers, this book presents up-to-date research, addresses common misconceptions, and discusses the pedagogical content knowledge necessary for effective teaching of key topics in biology. Chapters cover core subjects such as molecular biology, genetics, ecology, and biotechnology, and tackle broader issues that cut across topics, such as learning environments, worldviews, and the nature of scientific inquiry and explanation. Written by leading experts on their respective topics from a range of countries across the world, this international book transcends national curricula and highlights global issues, problems, and trends in biology literacy. "Teaching Biology in Schools is a comprehensive collection written by leaders in the field. The authors address a broad range of topics demonstrating how important biology is to our lives and why an education in the subject is vitally important. Each chapter shows how research can be used to inform the pedagogical choices that teachers make. I strongly recommend this book to anyone involved in biology education in schools. "Teaching Biology in Schools brings together a wonderful collection of scholars who are able to impart their wisdom based on years of research in science education in a manner that is clear, meaningful and accessible to teachers, graduate students and researchers alike. It brings a fresh perspective to teaching biology that is based on seminal and new trends in the field. It is also written from diverse viewpoints using scholars from around the world. In this sense, the book transcends borders and educational politics—focusing on underlying and unifying conceptual trends and issues in the field." Kostas Kampourakis is a researcher in science education and a lecturer at the University of Geneva, Switzerland. Michael J. Reiss is Professor of Science Education at UCL Institute of Education, University College London, UK.